This lesson will help train your ear to the standard tuning intervals on your guitar. This is a very useful technique when you have no tuning aids or note references, when playing by yourself. Note: this method doesn't work if you're playing with other instruments that are themselves perfectly tuned. This is just for those moments when you need a tuned guitar for solo playing. I personally use this technique (now more than the 5th fret method) to tune a guitar to itself. That means the strings may not be perfectly tuned to their individual pitches (E A D G B e), but they are tuned relativey, to each other. For example, the low E might be tuned slightly lower than a perfect E, but as long as all the other strings are tuned slightly lower as well, in relation to that low E string, the chords you play will all sound in tune. This lesson's all about picking two strings and knowing whether they're in tune with each other, without any external aids. Difficult? Nope, but your ears do need "training". So what's the benefit of being able to tune guitar by ear? 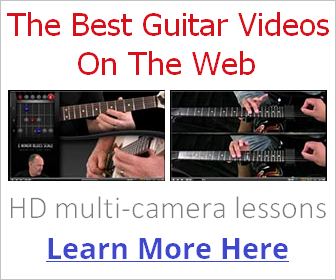 Well, for one you'll find that if you learn to hear intervals between strings and notes, this skill will carry over into other areas of learning guitar. The more you really focus on the relationship between two or more notes/strings, the less you have to rely on tab and visual aids. In fact, this is as good a place to start as any when it comes to learning to play guitar by ear in general. Secondly, this tuning method, in my opinion, beats the standard 5th fret method, because instead of tuning an open string to a fretted string (which causes natural inaccuracies), you're tuning an open string to another open string. I use this method all the time now because it becomes the fastest way to tune up once you master it. Play the strings one by one from the Low E to the high E string. Really get to know how each string sounds one after the other. What a lot of guitarists don't realise is that if you break it down and play, for example, the low E and A strings one after the other, that's a specific note interval you've played there. A perfect fourth interval to be specific. Try singing the notes if you like. This will help internalise the interval sound. Learn how these intervals sound before we move on to the next stage. The reason why I got you to learn the sound of each of those string pairings is because you're going to use these intervals as tuning aids. So, in effect, you're using your ears as guides here - do the intervals sound harmonious? If not, they're out of tune. Yep, seems fine. What about A and D? Again, sounds in tune. How about D and G? Ah! Out of tune. The G string is tuned too low, so we need to tune up. We know it's the G string that's out of tune because we already established the D string was in tune with A (and A was in tune with E). So now the G string is sorted we can continue with the G and B strings - remember the interval is different with these two. Not in tune! Ok, that needs tuning down, first lower than the G string, and then back up into tune. We tune up because the tension holds better keeping the string in tune longer than if you just tuned down and lost all the tension. Sounds kind of out of tune with the rest of the chord doesn't it? A good tip is to get the B string perfectly in tune in relation to the G string below it and then tune it up slightly. This B string business takes a bit of getting used to, but eventually you'll just tune it slightly higher as second nature. If you're still finding tuning by ear difficult, you can use the method below to fine tune. The best way to fine tune by far is to play the strings in groups of two, just like we did above, but this time listen closely for a "vibrating" or oscillating effect between the perfect 4th string pairings (note: this doesn't work for the G-B string pairing as the tuning intervals are different). That vibrating effect tells you the interval is imperfect and you should tune up or down until the interval is tuned and the vibration stops. You can use tuning harmonics to help with this (the lesson has audio examples so you can hear it for yourself). It's a very subtle thing you need to train your ear to pick up. After you've used this method several times, your fine tuning and time spent on tuning as a whole will shoot right down. Your ears will be trained over time and you'll pick up the tiniest inaccuracies in your guitar's tuning. Remember, some chords will sound OK if you're slightly out of tune, but others will just sound damn horrible. Make "tuning your guitar accurately" a habit from now!